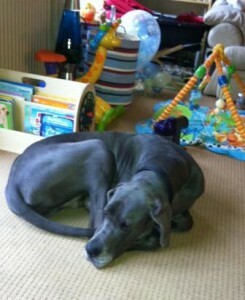 Merlin, the Great Dane, is a powerful thirteen-month-old adolescent. He is a bit of a canine hoodie, ambushing and going for poor Red Setter Blue and wanting to control everything around him. More worryingly, he has started to bully other dogs on walks. He will body slam into them, knock them over, stand over them and even pin them down, but he chooses his victims wisely. They are usually older or more timid dogs. A typical teenage bully! Don’t get me wrong – he is a gorgeous, intelligent dog with great potential, but he has an attitude problem – some of the time. He is supremely confident and fearless. ‘Brought up’ right by consistent and firm humans, he will be a wonderful adult dog. 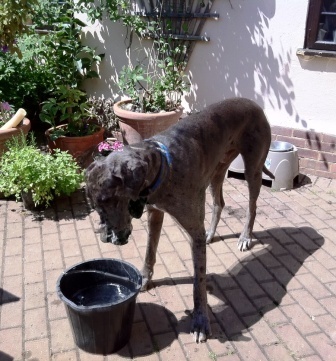 Another area that is creating difficulties is that, like many people, Merlin and Blue’s owners believe the best life for dogs is to have lots of freedom and uncontrolled access to a large garden. Whilst they have their own area indoors, the door is open most of the time, all the year round. As Merlin has got older, guarding tendencies have kicked in. Visitors sometimes have to run the gauntlet of the dogs when they open the gate; Merlin has pinned someone to the fence. 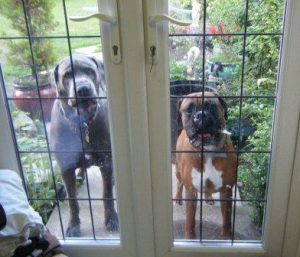 I have found in many cases that dogs can become a bit wild, uncontrolled and territorial when given open space and lack of boundaries. Setter Blue can be an agitated and restless dog, and this stirs Merlin up. When Blue is able to relax and settle down it should help the whole situation. ‘Training’ as such is lost on Merlin, because although he understand the commands perfectly well, if he doesn’t feel like cooperating there is little anyone can do! He’s huge. He ignores his owners because he believes what he wants is more important, especially when he is engaged in putting another dog in its place. So, they need to work on becoming MORE IMPORTANT in the eyes of Merlin – through leadership and using more of a psychological approach. There are, after all, ways of getting a teenager to tidy his room – but commanding him to go and do it straight away probably invites refusal! Then what? 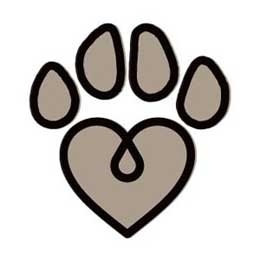 So it is with wilful dogs. There are ways! Yesterday I visited the largest Wolfhound I have ever seen, and a nearly as large Great Dane X. Monty, the Great Dane, was rescued from a life of neglect and possibly abuse just a year ago, and you can see from the photos what state he was in – and how good he looks now, a year later. 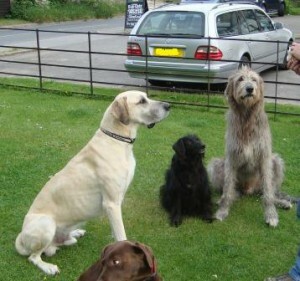 (To get a sense of scale, the two big dogs are sitting in the photo with their other dog Tess who is the size of a Springer Spaniel). 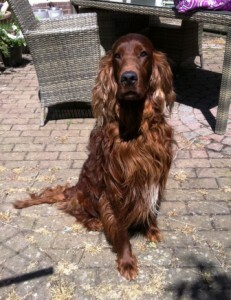 Not only does Monty now look good, but his owners have worked so well with him that he is a chilled, well-mannered, cooperative giant in all aspects bar one – his very occasional unpredictability towards other dogs and a couple of times with Freddie, their Wolfie. 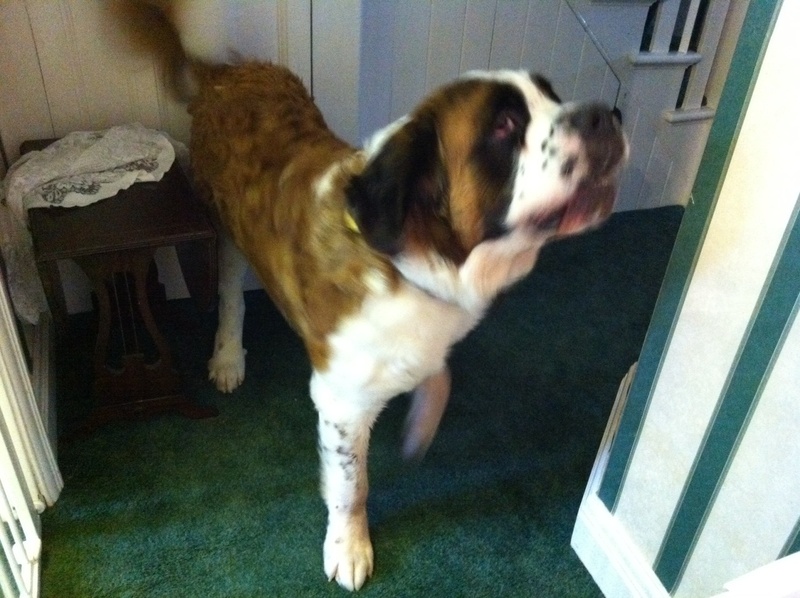 When the dog the size of Monty wants to attack, it is serious! These people have had many large dogs, but mostly from puppies. They have always felt proud walking out with their well-behaved, well-socialised giants. Starting with an attack on Freddie over a toy resource, the incidents have now escalated to two or three dogs out on walks. Monty had been mixing beautifully with a great many dogs, and the three that have been on the receiving end were all dog-reactive themselves. His very power makes this dangerous, and the lady owner who does most of the walking is shaken and nervous which obviously transfers to Monty, so the situation is slowly gathering momentum. Monty now is walked on lead only, and because word has got about, previously friendly dog walkers are avoiding them and this is very upsetting. It is quite hard to find what these very switched-on people could be doing differently, but what is certain is that if they carry on as they are, so will Monty. He obeys coming back when called when he is ready so he freelances. He is a big hunter in every sense of the word. He won’t have other dogs dominating him – which seems to be the trigger for his aggressive spats – which end as quickly as they begin. The lady in particular will need to work at her leadership skills and calm confidence, whilst carefully managing Monty so that the situations simply can’t arise. I hope by walking him calmly by dogs he shows no reaction to (on a loose lead), letting him mingle with his doggy friends, and most importantly walking away from dogs as and when they choose, over and over, the owners can condition Monty to look to them for guidance and to walk away from trouble when called, so that eventually he can once more be trusted off lead. Today I met Troy! What a treat. Look at that face! When I sat down he towered over me. 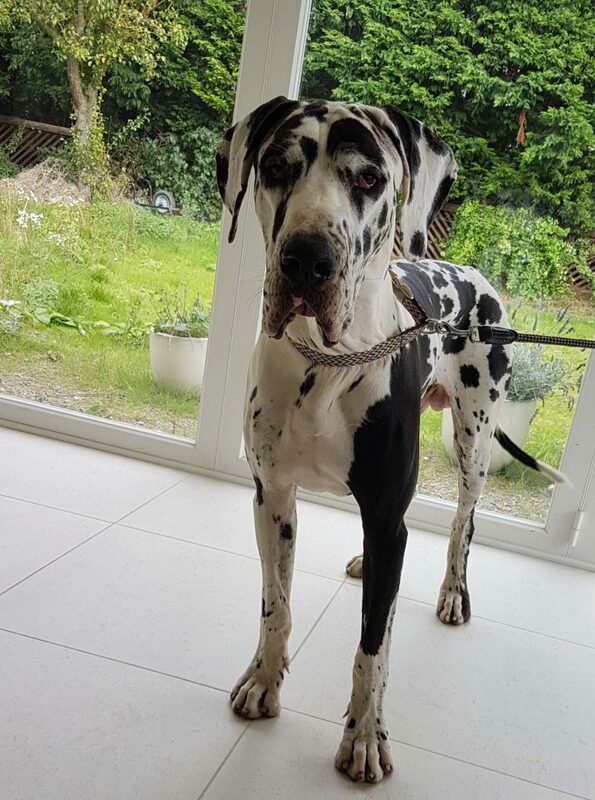 The Great Dane lives with a couple who have an eighteen week old baby and a toddler – people with their hands full at the moment. Troy at only fifteen months old himself may not have quite enough to keep his clever mind occupied, so he is finding things for himself to do. Things like wrecking beds when he is left alone and chewing the kitchen table and chairs. Chewing the children’s toys hasn’t occured to him fortunately, and he’s very gentle around the baby and the little boy. It’s great fun pretending to want to come in from the garden and then giving the run-around when they open the door – especially when after several circuits of the garden it means causing chaos by running in over the carpet with huge muddy feet! It’s great fun running off to play with other dogs and giving the run-around when they want to get him back. It’s great fun to cause chaos in the kitchen with little polystyrene beads from a destroyed bed all over the floor like snow. His owners’ response when they get home isn’t quite so much fun though – but at least it’s attention. Giving Troy commands merely gives him the opportunity to refuse, so we are finding ways to outwit him. When your dog exasperates you, you perhaps don’t realise just how many times you are saying No, or Down, or Bed! As with a child, it’s good to think of ways to show him what you would like him to do instead. 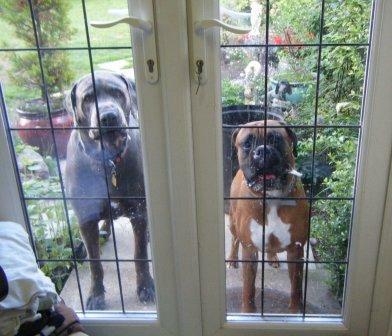 Rather than being cross when Troy doesn’t come in from the garden, they are going to teach him that it’s rewarding to come in straight away when called, and no fun at all if he doesn’t.